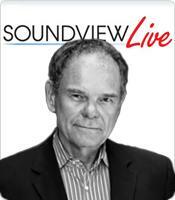 In this Soundview Live webinar, Don Tapscott demonstrates that collaborative innovation is not only transforming our economy but all of society and its many institutions. Tapscott argues that the onus is on each of us to lead the transformation in our households, communities and workplaces. After all, the potential for new models of collaboration does not end with the production of software, media, entertainment and culture. Why not open source government, education, science, the production of energy, and even healthcare? Drawing on an entirely new set of original research conducted with countless collaborators in fields such as healthcare, science, education, energy, government and the media, Tapscott tells the stories of some of the world's most dynamic innovators, from a global citizen's movement working to reverse the tide of disruptive climate change to for-profit startups that are turning industries ranging from music to transportation on their head. The audio recording, video recording, and the 8-page book summary of Macrowikinomics will be available to listen to or download from your Online Library immediately after check-out. About a powerful new model of economic and social innovation that is sweeping across all sectors. How to take advantage of new Web-based tools to get more involved in making the world more prosperous, just and sustainable. About vivid new examples of organizations that are successfully embracing the principles of wikinomics to change the world.